Commander Kalahaiea "Kali" t'Leiya is the Chief Starfleet Intelligence Officer aboard Starbase Aeon. Physical Description: Tiny and wiry, to look at her one would guess she weighs a fair amount less than she does. Far stronger than the average human, despite her small size, with very fast reflexes. 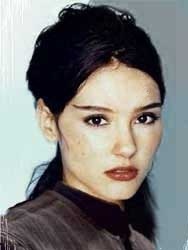 Due to differences in human and Romulan lifespans, at nearly 40, she closely resembles a human in her early 20s. Kalahaiea is the daughter of two former heirs to Romulan Senate seats, who defected to the Federation while serving as young officers in the Romulan fleet, feeling that the true power in the Empire now lay with the Tal Shiar and that they would be unable to properly fulfill the duties they would eventually inherit and speak their minds as Senators. 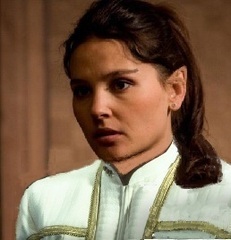 During her formative years in fact, they explained their actions to their daughter not as a matter of betrayal or a rejection of the Empire or Romulan society as a whole, but rather as a matter of honor, and their refusal to take on duties they would not have felt free to fulfill properly. They conceived Kali, their first child, shortly before leaving the Empire; making their way out of Romulan space, across the Neutral Zone, and eventually all the way to Earth by booking transport on, as Kali has described it, "every shady vessel in the quadrant". Kali, born on Earth shortly after her parent's arrival, was granted Federation citizenship. Of interest is that neither she nor her parents in favor of the idea of reunification between the Romulans and the Vulcans, although Kali, given her upbringing in the Federation, has a great deal of respect for the Vulcans, and is currently a student of Ensign Tybal in an attempt to improve her personal control. She is known to most all as "Kali", as most have difficulty properly pronouncing her full first name. Like many children of immigrant parents, Kali was raised caught between two worlds, learning both Romulan and Human traditions and turning out as an amalgam of both cultures. Because of this, she tends to feel as if she fits in nowhere; that the mix of Romulan and Human traits she possesses has left her an alien to members of both societies. She entered the Academy at the age of 17; profoundly relieving her parents, who had feared that their own actions in leaving the Empire might have robbed their child of the chance to serve as so many generations before them had. After graduation, she attended flight school, then reported to her first posting, as a fighter pilot during the Dominion War. She eventually participated in the final battle of the war—a battle which only 22 pilots aboard her ship survived, out of an initial 6 squadrons. Following the Dominion War, she was promoted to Lieutenant and posted to the USS Marathon, where she was one of several dozen pilots later selected to go hunt for the missing USS Liberty—what should have been a quick and easy mission. However, the mission ended with the pilots becoming stranded on the Liberty and the Liberty becoming stranded far behind enemy lines, and Kali, the senior pilot among the survivors, was forced to step into the roll of Chief of Flight Operations—without having been so much as a squadron commander first. Throughout the years that followed, she learned to command mainly through trial-and-error, a fact which has led to her unique command style, which tends to be very different from most other officers. After the Liberty’s return to Federation space, she was tapped to join Project Infinite, serving again as Chief of Flight Operations; later, during the war with the Rukakon, she served briefly as first officer aboard the USS Aegis due to manpower shortages. She temporarily served as captain of the Aegis as well, and was cleared of the ship's subsequent loss due to her medical circumstances at the time. However, she her own confidence in herself majorly shaken after that loss, and acquiesced to repeated prior 'feelers' and interest from Starfleet Intelligence; formally transferring to Intelligence in 2383 and serving as an analyst at headquarters on Earth. 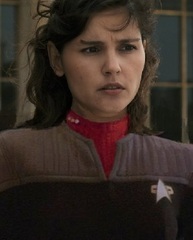 In 2386, she was assigned to Outpost 112, as Gateway's Intelligence Liaison to Starfleet Command. Following the destruction of the outpost, she was evacuated with the rest of the survivors to Starbase Aeon, where she soon took up a position as the intelligence chief aboard, following the removal of the officer formerly holding the position for having too many Ferengi gambling debts. Kali displays the typical 'creature of extremes' behavior that most Romulans are capable of; but her relatively young age — combined with the lack of the strict military discipline most young Romulans have learned — has made her even more susceptible to such than most, and she has been known to possess a somewhat volatile temper that she sometimes struggles to keep in check. Her romantic endeavors have tended to end badly: Her several-year relationship with Commander Johnny Storm is on-again-off-again; it first ended when he departed on an unauthorized mission without leaving notice to her and was presumed dead for several years, and while the two reconciled some time after his return, they parted ways again after Kali's parents rebuffed Storm's request to marry their daughter; stating her young age and his much shorter lifespan as their primary reasoning, and she refused to marry without their consent. While the two have recently rekindled their relationship for a third time, it remains to be seen how it will turn out. Her relationship with Commander Evan James McNamara, meanwhile, which occurred in between her first two involvements with Storm, didn't last for more than a few months, and consisted mainly of the two fighting with one another. In addition to her love of flight, she enjoys gambling, waterskiing, and parrises squares; she speaks both Federation Standard and Romulan fluently as her "first" languages; and is also fairly fluent in Vulcan and Klingon.